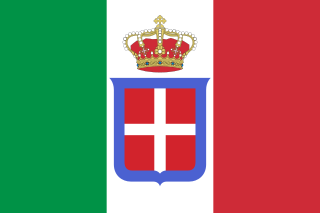 Italian Libya (Italian : Libia Italiana; Arabic : ليبيا الإيطالية‎, Lībyā al-Īṭālīya) was a colony of the Kingdom of Italy located in North Africa, in what is now modern Libya. Italian Libya was formed from the Italian colonies of Cyrenaica and Tripolitania that were taken by the Kingdom of Italy from the Ottoman Empire in 1911, during the Italo-Turkish War of 1911 to 1912. The unified colony was established in 1934 by governor Italo Balbo,  with Tripoli as the capital  . Italian settlers in Libya typically refers to Italians, and their descendants, who resided or were born in Italian Libya, in the colonial period preceding independent Libya. The Kingdom of Libya, originally called the United Kingdom of Libya, came into existence upon independence on 24 December 1951 and lasted until a coup d'état led by Muammar Gaddafi on 1 September 1969 overthrew King Idris and established the Libyan Arab Republic. Mogadishu, locally known as Xamar or Hamar, is the capital and most populous city of Somalia. Located in the coastal Banadir region on the Somali Sea, the city has served as an important port for millennia. As of 2017, it had a population of 2,425,000 residents. Mogadishu is the nearest foreign mainland city to Seychelles, at a distance of 835 mi (1,344 km) over the Somali Sea. 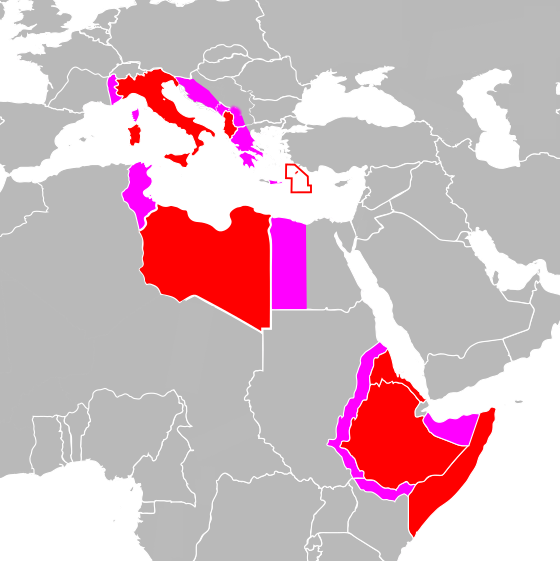 After the Italian Empire's conquest of Ottoman Tripolitania (Ottoman Libya), in the 1911–12 Italo-Turkish War, much of the early colonial period had Italy waging a war of subjugation against Libya's population. 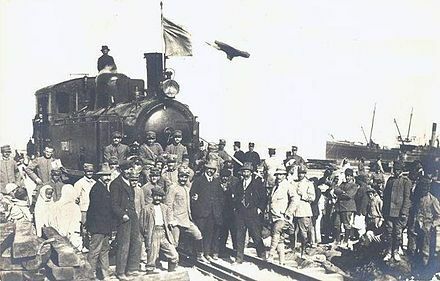 Ottoman Turkey surrendered its control of Libya in the 1912 Treaty of Lausanne, but fierce resistance to the Italians continued from the Senussi political-religious order, a strongly nationalistic group of Sunni Muslims. This group, first under the leadership of Omar Al Mukhtar and centered in the Jebel Akhdar Mountains of Cyrenaica, led the Libyan resistance movement against Italian settlement in Libya. Italian forces under the Generals Pietro Badoglio and Rodolfo Graziani waged punitive pacification campaigns using chemical weapons, mass executions of soldiers and civilians and concentration camps. One quarter of Cyrenaica's population of 225,000 people died during the conflict. After nearly two decades of suppression campaigns the Italian colonial forces claimed victory. The Treaty of Lausanne was a peace treaty signed in the Palais de Rumine, Lausanne, Switzerland, on 24 July 1923. It officially settled the conflict that had originally existed between the Ottoman Empire and the Allied French Republic, British Empire, Kingdom of Italy, Empire of Japan, Kingdom of Greece, and the Kingdom of Romania since the onset of World War I. The original text of the treaty is in French. It was the result of a second attempt at peace after the failed Treaty of Sèvres, which was signed by all previous parties, except the Kingdom of Greece, but later rejected by the Turkish national movement who fought against the previous terms and significant loss of territory. The Treaty of Lausanne ended the conflict and defined the borders of the modern Turkish Republic. In the treaty, Turkey gave up all claims to the remainder of the Ottoman Empire and in return the Allies recognized Turkish sovereignty within its new borders. Fezzan or Phazania is the southwestern region of modern Libya. It is largely desert, but broken by mountains, uplands, and dry river valleys (wadis) in the north, where oases enable ancient towns and villages to survive deep in the otherwise inhospitable Sahara Desert. The term originally applied to the land beyond the coastal strip of Africa proconsularis, including the Nafusa and extending west of modern Libya over Ouargla and Illizi. As these Berber areas came to be associated with the regions of Tripoli, Cirta or Algiers, the name was increasingly applied to the arid areas south of Tripolitania. Fezzan is Libya’s poorest region. Italo Balbo was an Italian Blackshirt leader who served as Italy's Marshal of the Air Force, Governor-General of Libya, Commander-in-Chief of Italian North Africa, and the "heir apparent" to Italian dictator Benito Mussolini. In 1931, the towns of El Tag and Al Jawf were taken over by Italy. British Egypt had ceded Kufra and Jarabub to Italian Libya on December 6, 1925, but it was not until the early 1930s that Italy was in full control of the place. In 1931, during the campaign of Cyrenaica, General Rodolfo Graziani easily conquered Kufra District, considered a strategic region, leading about 3,000 soldiers from infantry and artillery, supported by about twenty bombers. Ma'tan as-Sarra was turned over to Italy in 1934 as part of the Sarra Triangle to colonial Italy by the Anglo-Egyptian Condominium, who considered the area worthless and so an act of cheap appeasement to Benito Mussolini's attempts at empire. During this time, the Italian colonial forces built a World War I–style fort in El Tag in the mid-1930s. 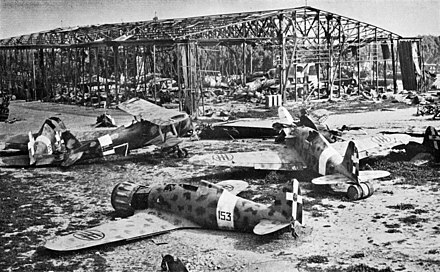 Under the terms of the 1947 peace treaty with the Allies, Italy relinquished all claims to Libya. 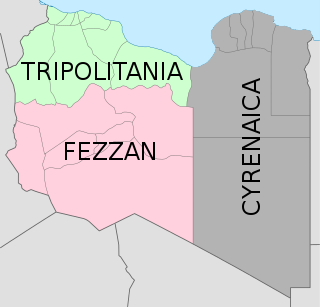 Tripolitania and Cyrenaica were under British military administration, while the French controlled Fezzan. On November 21, 1949, the UN General Assembly passed a resolution stating that Libya should become independent before January 1, 1952. On December 24, 1951, Libya declared its independence as the United Kingdom of Libya, a constitutional and hereditary monarchy. The Italian population virtually disappeared after the Libyan leader Muammar Gaddafi ordered the expulsion of remaining Italians (about 20,000) in 1970. Only a few hundred of them were allowed to return to Libya in the 2000s. In 1939, laws were passed that allowed Muslims to be permitted to join the National Fascist Party and in particular the Muslim Association of the Lictor (Associazione Musulmana del Littorio). This allowed the creation of Libyan military units within the Italian army. 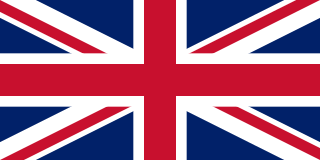 In March 1940, two divisions of Libyan colonial troops (for a total of 30,090 native Muslim soldiers) were created and in summer 1940 the first and second Divisions of Fanteria Libica (Libyan infantry) participated in the Italian offensive against the British Empire's Egypt:  1 Libyan Division Sibelle and 2 Libyan Division Pescatori. 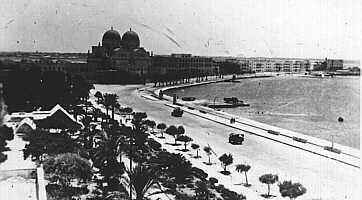 Italians greatly developed the two main cities of Libya, Tripoli and Benghazi  , with new ports and airports, new hospitals and schools and many new roads & buildings. Subdivisions of Libya have varied significantly over the last two centuries. Initially Libya under Ottoman and Italian control was organized into three to four provinces, then into three governorates (muhafazah) and after World War II into twenty-five districts (baladiyah). Successively into thirty-two districts (shabiyat) with three administrative regions, and then into twenty-two districts (shabiyat). In 2012 the ruling General National Congress divided the country into governorates (muhafazat) and districts (baladiyat). While the districts have been created, the governorates have not. The Provinces of Libya were prescribed in 1934, during the last period of colonial Italian Libya, and continued through post-independence Libya until 1963 when the Governorates system was instituted. The history of Libya as an Italian colony began in the 1910s and lasted until February 1947, when Italy officially lost all the colonies of the former Italian Empire. It can be divided in two periods: the first from 1911 to 1934 called "Italian colonization" and the second from 1934 called "Italian Libya". The military history of Libya covers the period from the ancient era to the modern age. Imperialism, colonialism and irredentism played an important role in the foreign policy of Fascist Italy. Among the regime's goals were the acquisition of territory considered historically Italian in France and Yugoslavia, the expansion of Italy's sphere of influence into the Balkans and the acquisition of more colonies in Africa. The pacification of Libya (1923–32), the invasion of Ethiopia (1935–36), the invasion of Albania (1939), the invasion of France (1940), the invasion of Greece (1940–41) and the invasion of Yugoslavia (1941) were all undertaken in part to add to Italy's national space. The Libyan Coastal Highway, formerly the Litoranea Balbo, is a highway that is the only major road that runs along the entire east-west length of the Libyan Mediterranean coastline. It is a section in the Cairo–Dakar Highway #1 in the Trans-African Highway system of the African Union, Arab Maghreb Union and others. This is a survey of the postage stamps and postal history of Libya. Libya is a country located in North Africa. Bordering the Mediterranean Sea to the north, Libya lies between Egypt to the east, Sudan to the southeast, Chad and Niger to the south, and Algeria and Tunisia to the west. Tripoli Province was one of the provinces of Libya under Italian rule. It was established in 1937, with the official name: Commissariato Generale Provinciale di Tripoli. It lasted until 1947. The Southern Military Territory refers to the jurisdictional territory within the colony of Italian Libya (1911–1947), administered by the Italian military in the Libyan Sahara. Postage stamps of Italian Libya were stamps issued by the Kingdom of Italy for use in Italian Libya, between 1912 and 1943. ↑ "HISTORY OF LIBYA". HistoryWorld. 1 2 3 4 5 Istat (December 2010). "I censimenti nell'Italia unita I censimenti nell'Italia unita Le fonti di stato della popolazione tra il XIX e il XXI secolo ISTITUTO NAZIONALE DI STATISTICA SOCIETÀ ITALIANA DI DEMOGRAFIA STORICA Le fonti di stato della popolazione tra il XIX e il XXI secolo" (PDF). Annali di Statistica. XII. 2: 269. Archived from the original (PDF) on 3 August 2014. Retrieved 24 December 2013. ↑ "International Boundary Study No. 3 (Revised) – December 15, 1978 Chad – Libya Boundary" (PDF). The Geographer Office of the Geographer Bureau of Intelligence and Research. Archived from the original (PDF) on 2007-09-26. ↑ William James Makin (1935). War Over Ethiopia. p. 227. ↑ teacher, Alistair Boddy-Evans Alistair Boddy-Evans is a; experience, African history scholar with more than 25 years of. "A Timeline of African Countries' Independence". ThoughtCo. ↑ Hagos, Tecola W (November 20, 2004). "Treaty Of Peace With Italy (1947), Evaluation And Conclusion" . Retrieved 2018-02-20. 1 2 3 "Gaddafi to Rome for historic visit". ANSA. 2009-06-10. Archived from the original on 2009-06-16. Retrieved 2009-06-10. ↑ "Berlusconi in Benghazi, Unwelcome by Son of Omar Al-Mukhtar". The Tripoli Post. 2008-08-30. Archived from the original on 2013-12-02. Retrieved 2009-06-10. ↑ "Ambasciata Italiana a Tripoli - Libia". www.ambasciata.net. ↑ "Ambasciata d'Italia - Tripoli". ambtripoli.esteri.it (in Italian).